Cambodia's Prime Minister Hun Sen (L) extends a hand shake to China's President Xi Jinping before a meeting at the Great Hall of the People in Beijing (November 7, 2014). How Cambodia went from denouncing China to being Beijing’s most faithful client state. With the ASEAN and East Asia Summits fast approaching, the prevailing expectation is that Cambodia will once again earn China’s ‘appreciation’ by blocking any unified movement on the South China Sea issue. In recent months, the Cambodian government has engaged in much encomium over China. On August 3, Deputy Prime Minister Hor Namhong stated that Cambodia’s development “could not be detached” from Chinese aid. Council of Ministers spokesman Phay Siphan enthused: “Without Chinese aid, we go nowhere.” Such remarks are clear examples of just how close Cambodian and China have grown. But it wasn’t always the case. To retell a clichéd contradistinction: in 1988 Hun Sen described China as “the root of everything that is evil” in his country. 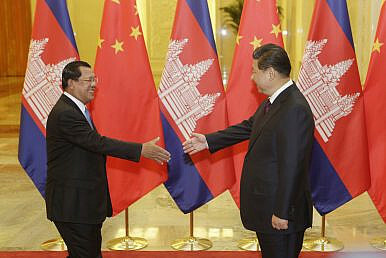 Twelve years later, China was Cambodia’s “most trustworthy friend” according to the prime minister. What explains this volte-face? How did China go from the serpent in Cambodia’s Eden to its trust guide? A little history is necessary. In 1958, five years after Cambodia gained its independence, Norodom Sihanouk formally established ties with communist China. (Sihanouk came to the throne in 1941, and ruled either as king or chief of state until 1970). Aid began flowing southward into Cambodia, used by Sihanouk to secure his country’s neutrality between United States and the Soviet Union, along with Moscow’s partner, Vietnam. However, after renouncing U.S. aid in 1963, Sihanouk moved closer to China and the communist bloc than the word “neutrality” would allow. For China, Cambodia provided a stable base to expand its influence in Southeast Asia. Geopolitics, of course, were certainly at the foreground of this relationship, but so too were personal friendships. An insightful essay by Julio A. Jeldres, Norodom Sihanouk’s former private secretary, published in 2012, tells of the rapport between the Cambodian leader and China’s then-premier Zhou Enlai, which began after their first meeting in 1955. Above all, flattery was the order of the day, and “Sihanouk was impressed by Zhou’s courtesy, which made him feel that much smaller Cambodia was on a par with ‘great China’ and that he and Zhou were equals,” Jeldres wrote. Nor to be overlooked was the importance of the Chinese community in Cambodia. “Relations between [the] majority community and the Chinese [local population] are probably better than in any country in Southeast Asia,” wrote William E. Willmott in his 1967 book, The Chinese in Cambodia. The emergence of the Khmer Rouge, however, proved problematic. Because of China’s support for the KR, Sihanouk initially severed ties with the PRC. But they were reinstated when, following a coup against him in 1970, Sihanouk became the public face of the KR from his home in Beijing. When the Pol Pot regime finally fell in 1979, four years after taking power, following Vietnamese liberation or invasion (depending on who you ask) Cambodia could not escape cold-war rivalry. The U.S. and China, now allies, opposed the Vietnamese-backed government, led by Hun Sen, effectively from 1985 onward. Instead, they supported the Coalition Government of Democratic Kampuchea, a “government-in-exile” composed of unlikely bedfellows: the Khmer Rouge, the royalist Funcinpec party, and the Khmer People’s National Liberation Front, an anti-Vietnamese, anti-Communist force. China wanted a government led by Sihanouk, its old friend. ASEAN (comprised of Brunei, Indonesia, Malaysia, the Philippines, Singapore, and Thailand in 1985) was in solidarity with the United States. The Soviet Union was in solidarity with Vietnam and, therefore, the Hun Sen regime. An impasse, to say the least. But then cracks began. Thai Prime Minister Chatichai Choonhavan broke with the ASEAN line and embraced the Hun Sen government in 1988. This was aided by the normalization of relations between the Soviet Union and China. Then, on September 26, 1989, the last Vietnamese troops withdrew from Cambodia and, two years later, the four Cambodian factions (the Hun Sen government plus the previously mentioned three composites of the Coalition Government of Democratic Kampuchea) met in Paris to end the Cambodian civil war. Buoyed by his visit to China, and, perhaps confident of its patronage, in July 1997 Hun Sen launched a coup against Funcinpec, ousting the party’s politicians from the power-sharing government. Western donors cut all but humanitarian aid and chastised the CPP’s takeover. ASEAN suspended Cambodia’s membership in the bloc, expected the following month. China, however, quick to an opportunity, carried on regardless, supplementing Cambodia’s financial shortfall with its own aid. The events of 1997 provided Hun Sen with confidence that China would stand by his government when Western nations put their foot down, however timidly — and Beijing would increase its aid in doing so. Any autocrat would be happy with a friend like China. In foreign affairs circles there is a cliché of tails wagging dogs.” And in common parlance there is the invective of “biting the hand that feeds.” In its relationship with the United States, the Hun Sen government likes to think it’s doing the former and be seen doing the latter. A gulf also exists in the U.S. stance on Cambodia: the Obama administration (much like earlier administrations) has oscillated between pragmatism and idealism, a mismatch seldom effective. When the president paid a visit to Phnom Penh in November 2012, U..S politicians urged him to publicly address human rights abuses when meeting Hun Sen. This he was said to have done, though at a rather brief meeting with the primer minister. Today, following the arrest of opposition lawmakers andcivil society workers and the killing of political commentator Kem Ley, the United States still resists taking a strong position on the Hun Sen government. One suggestion is that it prefers a stable Cambodia to a democratic Cambodia, a similar sentiment expressed in the early 1990s. Another is that it has resisted imposing sanctions on Cambodia lest it forces Phnom Penh even closer to China. This Hun Sen knows and manipulates to his own benefit. Granted, I have selected these quotes out of a paper of several thousand words. But if one was to substitute “Soviet Union” in the last passage for “the United States,” or simply “the West,” a great deal of continuation can be seen in how China approaches financial assistance to Cambodia. Nevertheless, the CNRP’s chauvinism would certainly pose difficulties if its natural ally, the U.S., calls on the party to support its position on the South China Sea dispute. If China is correct that Vietnamese-claimed islands are its own, why shouldn’t it also be so for those claimed by the Philippines? If the CNRP wins the 2018 general election (or if the CPP is willing to hand over power) it appears uncertain how Cambodia’s relationship with China would develop. As Myanmar’s National League for Democracy (NLD) found out following its victory at the polls last year, the natural inclination for “pro-democracy” parties to gravitate closer to the United States proves problematic when in power. That Suu Kyi chose Beijing, not Washington, as the first major capital she visited after the NLD’s victory meant a great deal. In any case, 2018 will be yet another watershed year for Sino-Cambodian relations. If the CPP wins, it seems almost certain that relations will continue as normal. If the CNRP does what seems highly unlikely and forms a government, the relationship will certainly be under debate. David Hutt is a journalist and writer based in Phnom Penh, Cambodia.